Living Room : This is one area where you spend perhaps the largest part of your time, entertaining guests, watching T.V. , reading newspaper or just chatting with the family. So the lighting should be such that illuminates the entire area. Tube lights and CFLs will work very well here .Many kinds of decorative lighting available in the market can be used to highlight your showpieces or paintings. A popular style of lighting, where the light comes out of a false ceiling which is constructed in the middle of the actual ceiling, can also be used to give a uniqueness to the room. Kitchen : A kitchen needs overall illumination, therefore a CFL or a tube light would be apt here. If your kitchen is large , and there are specific areas which need to be illuminated separately, like a small dining table, then you can go for pendant lights, which are suspended from the ceiling, and you can adjust the light as required. Bed Room : Bedrooms are multipurpose rooms like living room, where you can read, watch television, work on computer, and of course, sleep If you like to read before going to sleep, go for controlled reading lights on either side of the bed, so that it doesn’t disturb the other person in the room. If you have a baby in the room, you should install a dimmer bulb for the night, to check the baby during the night. For your parents’ or grandparents’ room, go for high wattage bulbs, and do not use lampshades as they may hinder the light. Dining Room : Here also, ambient light such as CFL or a tube light may be used, but you can also experiment by using different styles of hanging lights over the dining area. Adjustable pendant light allows you to adjust the light for the best possible view of the food. 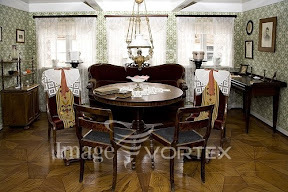 You can also put a dimmer on a chandelier to create different mood as well as to avoid glare during family meals time. Bathroom : It is best to construct a bathroom in an area where natural light is in abundance, reducing the need for artificial light. Use CFLs for general lighting and lights around the mirror to help when you’re doing the makeup. Lights can also be installed in a false ceiling, as this light can be controlled. Choose tiles in such colors that make the bathroom appear brighter, and not darker. Outdoors: Outdoors should be lighted in such a way as to avoid lights away from the eyes, to avoid glare. Also, we need to illuminate only some key areas, such as pathway or certain decorative plants . Here you can install portable solar lights, which can get charged during the day and can be used up during the night to illuminate different areas of the lawn, hence saving on electricity also.